The St. Petersburg legislature has approved in the first reading a draft law on administrative responsibility for propaganda by the “gay, lesbian, bisexual and transgender” community. Under the proposed legislation, promoting homosexuality will be punished with a fine from 1,000 rubles ($32) for individuals to 50,000 rubles ($1,630) for legal entities. The United Russia party also suggests comparable fines for the propaganda of pedophilia. During the discussion, Liberal Democrat Deputy Elena Babich stated that administrative punishment is not enough for such actions and that, as criminals, they should involve criminal responsibility. She added that for the second reading, her faction will propose an amendment providing for more serious fines for media promoting pedophilia. Vitaly Milonov noted, however, that St. Petersburg legislature is only authorized to propose criminal amendments to the federal level. A protest rally followed the adoption of the legislation. 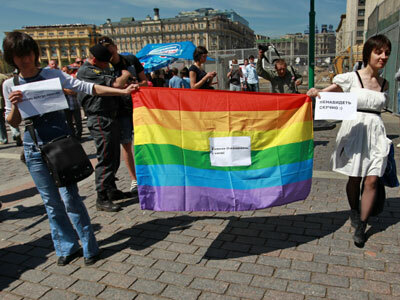 In front of the Mariinsky Palace, the seat of the local legislature, 10 people gathered holding posters which read, “Stop feeding people with homophobic laws” and “I love my gay son. He is now to become an outlaw”. “This draft law creates a threat for citizens’ rights to freedom of expression, assembly and association. We warn politicians against the use of right rhetoric and speculations about protecting children in their own interests,” St. Petersburg LGBT-organization said in a statement. They also reminded that since 1999, homosexuality has been recognized as a norm by the Heath Ministry.